Two masters together for an awesome tale. Sorry it's been so long with this review. It's just that we here at The Verbal Mosh have a ton of books to read. That's no joke. Just ask Olivia. She says i made reading comics a job. Well that's a lie. You get paid at a job. Anyway this yarn picks up with Karnilla who is queen of the norns sitting around fawning over Balder running off to help the Mighty Thor. If he's so mighty why does he always need help? The title should be the hapless Thor. But all is well because Balder is back and ready to mack on Karnilla. But gasp, it's a trap. It's some Frost Giants. They take Karnilla as a slave and depart for Jotunheim. Because that's where you keep it real. Balder and Agnar return from helping the Hapless Thor to find Karilla gone. A little bird tells Balder what has happened and they ride off to save Karnilla. Good thing that Balder can speak to the birds because the Frost Giants have tons of spells and illusions to keep our heroes out of Jotunheim. Seems like even Frost Giants don't like unwelcome guess. Karnilla is then turned into a bird, for the fact that well, at this point the Frost Giants can do whatever they please. Angar and Balder make camp right outside of Jotunheim. A former servant of Karnilla shows up at the campsite to tell Balder that he has a way into the castle. Balder goes alone to scope out the entrance with the servant of Karnilla. After some time Balder returns and attacks Agnar. Agnar holds back in the fight but then he comes to the conclusion that this being in not the real Balder and kills him. Turns out it was just the shape shifting Frost Giants who was able to over power Karnilla. 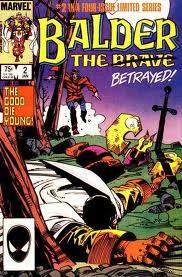 This issue ends when Agnar goes off in search of Balder only to find his lifeless body. Oh no! Since there are two more issues in this mini series I'm sure he ain't dead. Or is he. Be back here next week for issue three.